According to DNAinfo New York, a music club co-owned by Andrew W.K. has been closed under mildly mysterious circumstances. 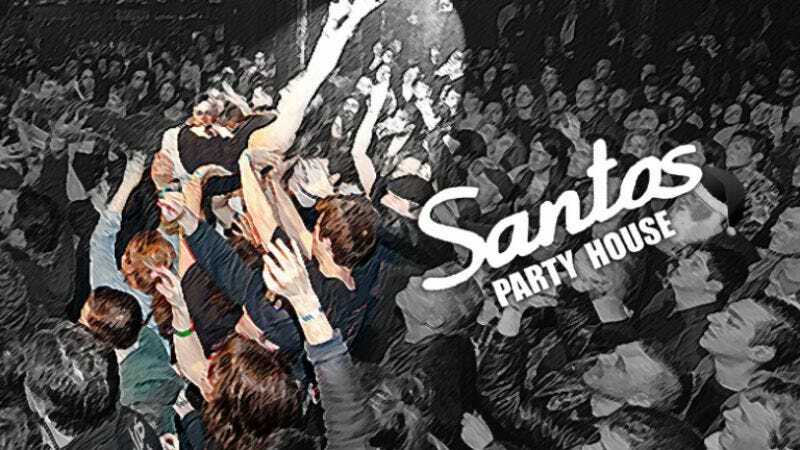 The club is called Santos Party House—because “party” has to be in there somewhere if Andrew W.K. is involved—and it suddenly closed for good on Monday despite having a few events scheduled for the coming months. Santos Party House’s manager says that the club has been closed simply because its lease had run out and the people in charge decided not to renew it, but apparently the decision came so abruptly that the venue recently had to send out emails explaining that any previously scheduled events have now been canceled. Though it doesn’t explain anything, Santos Party House did host Oi! Fest, a punk music festival associated with the skinhead movement—a scene well-known for its Neo-Nazi elements—on its final night. (The professional hate-group trackers at the Southern Poverty Law Center recently issued a press release condemning NYC Oi! Fest for its associations with “hate music.”) The second night of the festival was originally supposed to be held at Black Bear Bar in Williamsburg (as the first night was), but social-media outcry forced that venue to cancel it. Santos Party House management hasn’t released an official statement on the sudden closure, so it’s hard to say if the closure and the controversy are directly related. But this all does fit the bill of “mildly mysterious,” at least.